As a gift to our clients and added value service, when you purchase a Property through VIP Almeria, your property purchase will be Guaranteed for 20 years with Caser® Title Insurance. An estate agent accredited with the exclusive “Safe Purchase Brand” is giving you much more than other estate agents when purchasing your home in Almeria: a certified extra property protection guarantee for the next 20 years. 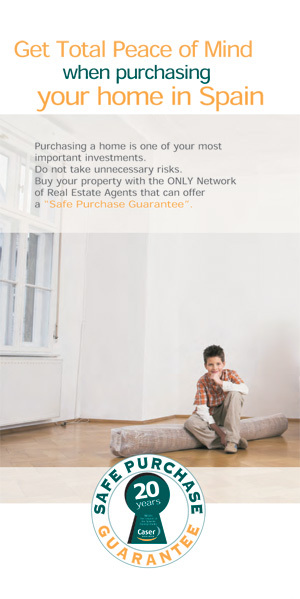 Caser® guarantee that all your legal rights stated in the title deed will be respected. Caser® certify that the property you have purchased fulfils all the agreed legal conditions. 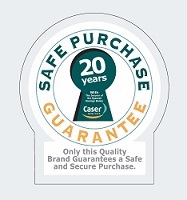 Caser® undertake a Guaranteed Commitment of Resolution within Six Months. Lawyers expert in Real Estate Law will manage your problem with the highest standards of diligence and efficiency and if we cannot sort out your title defect within six months, we will compensate. Cover up to the purchase price agreed in the title deed. Should the problem not be resolved within 6 months, Caser® - the Insurer of the Spanish Savings Banks - will compensate you for the damage suffered with a maximum limit of indemnity of 360,000 €. own property, forging your identity. Spanish Supreme Court has ruled in favour of a third party purchasing property in good faith. You could lose your property. If the property is bought “off plan” and following physical completion it is found to be more than 10% smaller than for what it was contracted. If the parking space is purchased “off plan” together with the property, and following physical completion it is found to be too small to park a standard size car in. If a judge rules that your property is subject to the previous owner's bankruptcy (preferential rights of the creditors). Or for example, there are outstanding taxes prior to your purchase that you should not pay. * Exclusions: Damage, contamination and all defects in the knowledge of the owner prior to the date this policy takes effect. The above is an outline of the cover offered by Caser®. When insurance is issued by Caser® the terms and conditions of the insurance may vary. The terms and conditions issued with the insurance will always be deemed to be correct even if they differ from those outlined above.